The Fedora Design Team Bi-weekly Bounty is a bi-weekly (well, at least monthly! 😉 ) blog post where we’ll outline a quick-and-easy design project that needs doing for the Fedora Community, outlining all the tools, files, and other resources you’ll need to complete the project. If you’re a designer and are interested in getting involved in the free and open source community, this is a good opportunity to get your feet wet! However, we don’t have a single, consistent yet flexible template to meet our presenters’ needs. 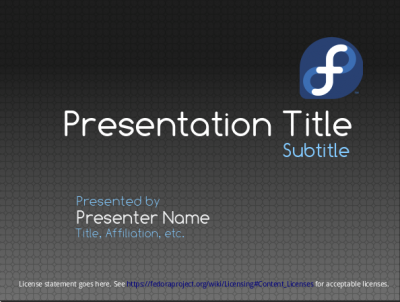 Your mission, should you choose to accept it, is to create a stunning-looking base Fedora presentation template that our worldwide community of users and contributors can use, whether or not they’re giving a presentation at their local Linux Users’ Group or at a well-known international conference. I’ve put together a page on the Fedora wiki outlining the requirements of this project, providing the general guidelines, a base template you can open up and use to start designing with, and even some inspiration in the form of other slide presentations that look nice. You’ll be starting out with some basic template content to style, so you can focus solely on the look and feel and not worry about generating sample content on your own. Base presentation template file – this is the blank canvas upon which you will unleash your awesome design ninja skills! Download it and play away! The Comfortaa fonts – this is a typeface designed by Johan Aakerlundthat the Fedora design team is currently trying out on a trial basis as a headline font for our branding materials. It is currently under a CC-BY-ND license, but Johan has agreed to relicense it to a license suitable for Fedora! (WOOO!) By using this font, you’ll be helping us put it to the test! To install this font on Fedora, make a directory called “.fonts” in your home folder and move the font file into that folder. Droid Sans fontthis is a typeface that the Fedora design team is currently trying out on a trial basis as a body text font for our branding materials. Droid Sans is a set of free & open source fonts. If you have Fedora you can install them by using ‘yum install mgopen-modata-fonts’ or by searching in PackageKit. If you don’t have Fedora you can download the fonts from their website. On Fedora, you install them by making a directory called “.fonts” in your home folder and moving the font files into that folder. OpenOffice.org – You may install it on Fedora using ‘yum install openoffice.org-writer’ or by searching for it in PackageKit. If you are not using Fedora, you can download it here. You’ll need OpenOffice.org to work with the ODT source file. Inkscape – You may install it on Fedora using ‘yum install inkscape’ or by searching for it in PackageKit. If you are not using Fedora, you can download it here. Inkscape is going to be a useful tool for you to quickly mockup the look & feel for a slide before producing it in OpenOffice.org, and also a great tool for producing illustrations. Fedora presentation wiki page chock full o’ requirements and inspiration for you, and first steps in getting started on this project! The OpenOffice.org Impress guide – has lots of tips, especially detailed information on using the Styles & Formatting dialog, which you’ll need to use in creating this template. The Fedora Design Team: please drop by #fedora-design on irc.freenode.net for any assistance! (Join our chat on the web here. Or join and drop an email to our mailing list. If you don’t already have it, you’ll get membership into the Fedora Design Team, which includes Fedora voting privileges and hosting space for Fedora-related projects. You’ll build skills in using Inkscape and OpenOffice.org – these are excellent free & open source tools that are worth learning because you can use them for just about any design project in the future and they are free forever. You’ll also build skills in addressing general layout challenges! If you send me your snail mail address, I will send you a thank you card, a full-color copy of your design, and some Fedora swag in thanks for your help! You’ll gain experience in contributing to a free/open source project. Bragging rights as a free/open source project design ninja & more importantly a Fedora Design Team Bi-weekly Bounty designer! You’re totally pumped, right? Awesome. So where to start? 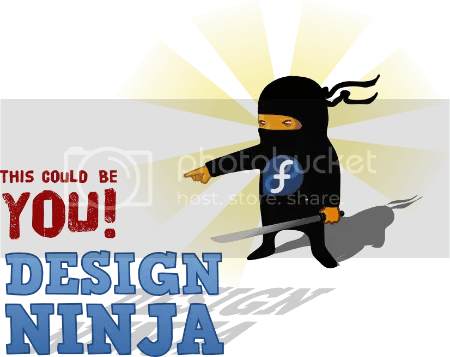 Ninja by Hector Gomez from openclipart.org – Public Domain. If you are interested in taking this bounty on please make a comment to this blog post below. The first person to claim it in the comments will have exactly 48 hours to give it a shot, at the end of which the bounty will be opened up for someone else (you can try to re-claim it if you want.) I will announce all status changes in the comments. You must provide source files for your work. This is so we can make any necessary edits or provide translations for the document, create a reusable template out of your awesome deign, or just generally learn from how your design works. If you’re working with OpenOffice.org, this means we need the ODT file, and any SVGs or other graphics you may be incorporating into it. You’ll need to abide by the Fedora brand guidelines – but please don’t let this stifle any awesome creative and innovative ideas you might have – just check in with your Fedora design team compatriots first. 🙂 More information and pointers to resources on our branding guidelines is available on the wiki page for this project. When you’re ready to submit your work,submit it on the presentation template wiki page. If you need help email me (duffy at fedoraproject dot org) or pop into IRC! Looking forward to improving Comfortaa. Small correction about Droid Sans: “yum install google-droid*”. Other than that, yay about Comfortaa to be relicensed.! It is made by Kanarip (and not by me! ), but I think it looks very pretty and professional. wow that’s cool template biertie.. I don’t get it. Your post includes a complete template already! What are you asking them to do! The base template is pretty bare bones. I’ll try my hand at it, since no one else seems to want it. 😉 The base templates are good starting points, and its a great excuse to try a new font! I haven’t used Comfortaa yet, but I like it a lot. If anyone has any comments or critiques (be gentle! ;)) just let me know. Thanks! Thanks Mairin! I’ll apply asap, and I’ll keep an eye on the list! Thanks! I’m glad someone who knows what they’re doing came along. Great work, Emily! I had a bit of a go myself and came up with this: http://img.obfuscatepenguin.net/fedora/slideshow-template/ but I just could not get the two master slides to use different backgrounds. Hi Marc. Thanks! I really like your template, too – you should upload it to the wiki! And I forgot to say in my original comment: I particularly liked your bullet points using the logo outline—those kinds of small details can make a big difference. Wow Marc, that is really nice!!! You should sign up for our next bounty, coming soon 🙂 If you send me an email to duffy at fedoraproject dot org so I have your email address I’d be happy to notify you when it gets posted! Just one idea : puth your template on OpenOffice extensions. Just one idea : put your template on OpenOffice extensions.